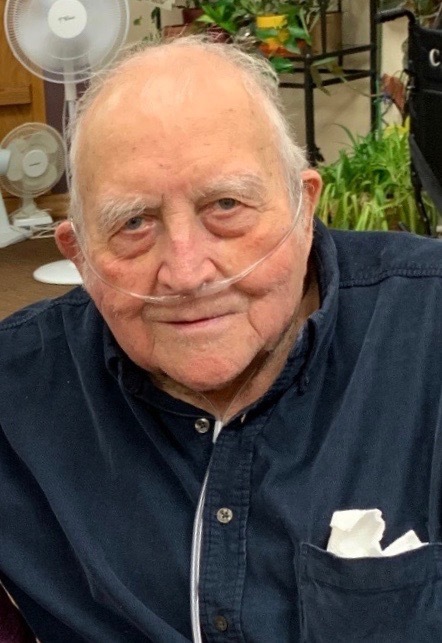 Lawrence Smith, 89, of Motley, MN died Sunday, April 14, 2019 at Lakewood Health System Care Center in Staples, MN. Mass of Christian Burial will be 11:00AM, Wednesday, April 17, 2019 at St. Michaels Catholic Church in Motley, MN with Fr. Gabriel Walz officiating. Visitation for family and friends will be 5-7PM, Tuesday at Brenny Family Funeral Chapel in Staples and one hour prior to the service at the church. Interment will be at St. James Cemetery in Philbrook, MN. Lawrence was born on the family farm next to St. James Cemetery on March 20, 1930 in Philbrook, MN to John and Mary (Macho) Smith. The family moved to their current family farm in 1930. Lawrence served in the US Army prior to Korea. He married Iona Hales February 5, 1951 at Sacred Heart Catholic Church in Staples, MN. Lawrence worked in logging and drove his own log truck, farmed his whole life, ran a sawmill for business and pleasure, he had dairy cows, then beef cows and hogs. He loved to ride his 4 wheeler and picking mushrooms. On April 21, 1980, the Philbrook fire came through and wiped out the Smith farm. This type of loss would have destroyed a lesser man. Determined, Lawrence and Iona completely started over at the age of 50. He started taking flying instructions from Russ Lee in 1972 and enjoyed flying his own plane until the age of 82. Lawrence was a member of the Aircraft Owners and Pilots Association, Experimental Aircraft Association, Motley American Legion, Fawn Lake Town Board, School Board member of Philbrook Country School and was active at St. Michaels Catholic Church as an usher. Lawrence is survived by his wife, Iona of Motley, MN; children, Roger Smith of Motley, MN, LeRoy (Carolyn) Smith of Motley, MN, Gloria (Mark) Campbell of Motley, MN, David Smith of Motley, MN , Mark (Lori) Smith of Motley, MN; 10 grandchildren; and nine great grandchildren. He was preceded in death by his parents, John and Mary (Macho) Smith; siblings, Lorraine Kveton-Buhl, Marion Scheper Link, Bill (Sheila) Smith; son, Gary September 9, 1999; grandson, Jesse Lee Smith in 2004.